most prominent events on the calendar of process control engineers. SACAC facilitates the interchange and dissemination of information about leading edge technologies and their application locally and internationally. This is done through organising symposia, workshops and other regular events. The 18th Symposium on Mining Mineral and Metal Processing (MMM2019) is one of the most prominent events on the calendar of process control engineers. SACAC is proud to be hosting the symposium from August 28th to 30th in Stellenbosch. To enable employees and students of SACAC’s industrial or institutional members to participate in this international event, sponsorship money is made available to send eight SACAC member to the congress. 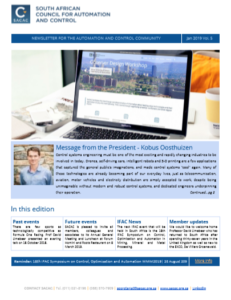 Please view our latest SACAC Newsletter edition for the Automation and Control Community.